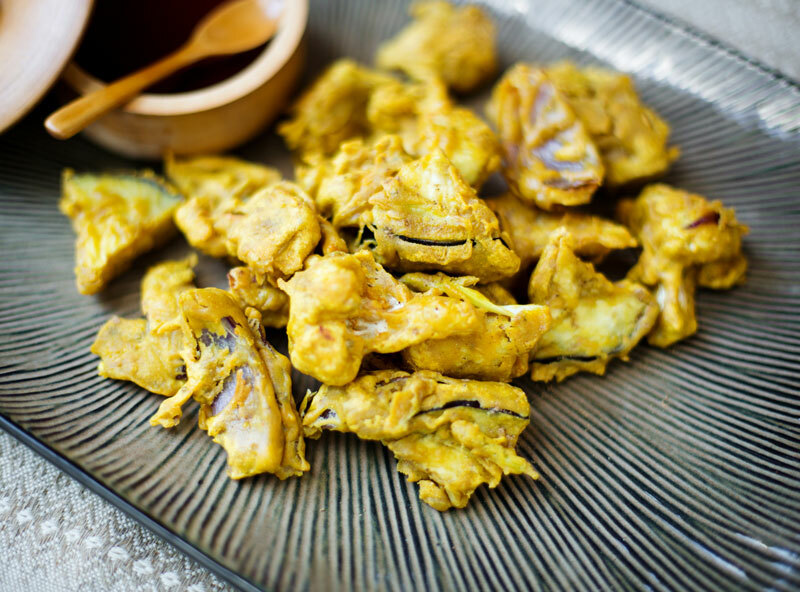 Try this easy recipe for a yummy traditional Indian Pakora (battered spicy vegetables). Great served with Tamarind sauce and a Pepper Tree Fine Foods curry. Place pakora batter in large bowl, add exactly 150ml cold water. Stir through until it forms a smooth paste. Let stand for 5 minutes. Cut eggplant in half lengthways, then into 1cm slices. Chop mushrooms in half. Cut cauliflower into small florets and onion into rings, separating each layer. Add prepared vegetables to the batter and mix with your hand or a pair of tongs coating the vegetables evenly. Using tongs carefully place some of the coated vegetable mixture into the pan. Fry, turning gently. Will take approximately 2 minutes to cook each batch. Place on paper towel to absorb excess oil. Repeat until all the mixture is finished. Great served with Tamarind sauce and a Pepper Tree Fine Foods curry kit!